Hello everyone... before we start, I want to tell you about the international evening next Tuesday. Remember, the party starts at 7 o’clock. The teachers will bring some music CDs from different countries. We hope you can all come! 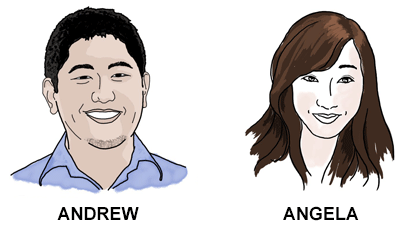 Examiner: Hello Angela, hello Andrew. My name is Richard. Examiner: Now I'd like you to ask each other some questions. Angela, I'd like you to ask Andrew about the things he reads. Andrew, I'd like you to ask Angela about how she learns English. Now think about the questions you want to ask. You have one and a half minutes. You can write down your questions if you want to. If you don’t understand, please ask me. Examiner: Angela, are you ready? Please ask Andrew your questions. Examiner: Andrew, are you ready? Please ask Angela your questions. Examiner: In this part of the test, you are going to listen to two recordings and answer some questions. You can make notes if you want to. You hear two teachers giving some information to a class. What is the information about? An international party, a computer class or a book sale? Examiner: Angela, what is the first recording about? 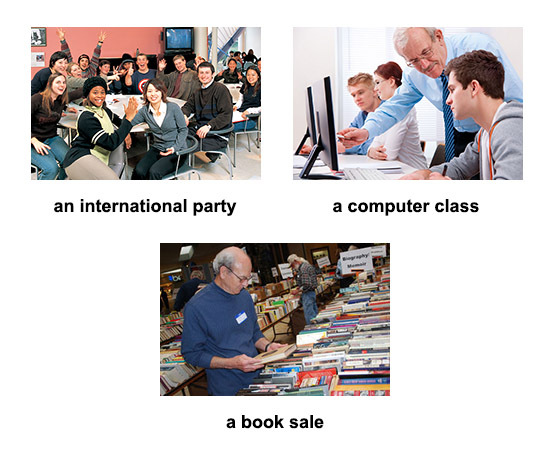 An international party, a computer class, or a book sale? Examiner: Andrew, what is the second recording about? An international party, a computer class, or a book sale? Examiner: Angela, in the first recording, what time does the book sale start? And how much does a coursebook cost? Examiner: Andrew, in the second recording, what time does the party begin? And what will teachers take to the party? Examiner: Now you’re going to talk together about parties and festivals. Talk to each other about parties and festivals you enjoy. What food do you eat at a party or festival?